In Robert Pirsig's classic book Zen and the Art of Motorcycle Maintenance, there's a terrific passage about a college professor dealing with a student whose writer's block prevents her from coming up with so much as 500 words on the United States of America. He tells the student to narrow her focus to the town they're in, to no avail. He suggests narrowing further, to the town's main street; she still can't think of anything to say. Finally, he loses his temper and orders her to start by writing about a single brick in the front of one building on the street -- and then, at last, her creative floodgates open. It's meant to be a lesson in the hows and whys of creative paralysis, but it's also a really memorable parable that illustrates that everything has a story -- even the things we take most thoroughly for granted -- a point underscored by Morgan Neville's beautiful, empathic, and honest documentary 20 Feet from Stardom, which begins by offering filmgoers a look inside the lives of some of the most successful background singers of the rock era, and ends by presenting not only a master class in the vagaries of success in the music business, but a passionate ode to the value of creating simply for the love of it. In trying to boil down the essence of background singing into a 90-minute feature, Neville had his work cut out for him; it's something like the cinematic equivalent of that 500-word essay on the United States. But he sketches the outlines of his subject cleanly and quickly, letting Bruce Springsteen tell the audience what a long walk it is from the back of the stage to the spotlight before narrowing 20 Feet's focus in on someone who made the trip: Darlene Love. After setting the stage, Neville pauses briefly to underscore rock's gospel roots before introducing more of 20 Feet's stars (including Merry Clayton, Lisa Fischer, and Tata Vega) and touching on the stories of the performers who benefited most strongly from their skill (including Ray Charles and Stevie Wonder, who humorously points out how integral background vocals are to the existence of Charles' classic hit "What'd I Say"). It would be easy for Neville -- or his subjects -- to stumble into bitterness; after all, one of its biggest points is that nobody really notices the people it's focused on. But as artists like Tata Vega and Claudia Lennear talk about flop records and lost solo contracts, and even as Love recounts her journey from superstar to housecleaner, 20 Feet from Stardom becomes more than an ode to performers who spend most of their careers out of that spotlight. As Sting points out in one scene, success in the music business isn't about talent, it's about luck and circumstance, and the best people find a way to deal with that. 20 Feet focuses on the best people, and their enduring faith in the redemptive power of song offers a subtle, exultant rebuttal to the American Idol dream of overnight fame as a means to its own end. Like Pirsig's bricks, they all have their own incredible story to tell; take them away, and the entire edifice crumbles. 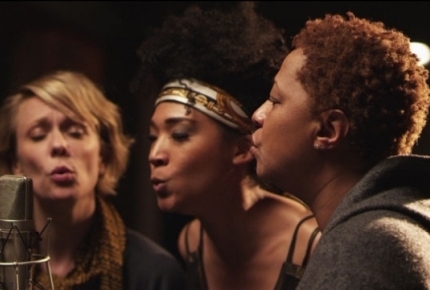 "Sing your heart out," exhorts Wonder at one point, and after watching 20 Feet from Stardom, you'll not only believe such a thing is truly possible, you'll understand it's a dream worth aspiring to in its own right. Sundance is well under way and in its second day, acquisitions have already been announced. Jeff is an entertainment writer and editor whose work currently appears at a variety of sites, including Rotten Tomatoes, Paste, American Songwriter, Popdose, Dadnabbit, Diffuser, and Ultimate Classic Rock.